Nun’s Sighs (Suspiros de Monja) are a typical Spanish pastry that is golden and crispy on the outside and rich and creamy on the inside. A thick batter is prepared and spoonfuls are fried, then sprinkled with powdered sugar or candied fruit. These Nun’s Sighs could even be considered a cookie. 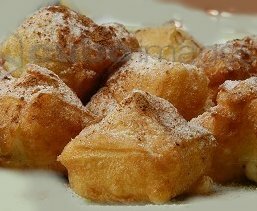 Nun’s Sighs are basically a typical Spanish fritter whose origin goes back a few centuries and is another one of Spain’s characteristic desserts that was originally created by nuns. Convents in Spain were famous for this delicate sweets that were produced within its walls. In Spain, legends says that while nuns were preparing some buns using choux pastry dough (a typically French pastry) one of them expelled some wind and the others nuns burst out laughing. This Nun’s Sighs recipe is courtesy of Cynthia Detterick-Pineda of Andrews, TX. Check out more of Cynthia’s Southwest Recipes. In a medium-size saucepan, place butter, sugar, salt, lemon zest, and water; bring just to a boil. As soon as it comes to a boil, quickly add the flour all at once. Beat vigorously with a wooden spoon until the mixture comes off the sides of the pan and forms a smooth ball. Remove from the heat and let stand until it is just lukewarm. When the mixture is lukewarm, add the eggs and stir until just blended. Then beat vigorously until the mixture forms a smooth velvety thick paste. Refrigerate the dough until it is easy to handle, approximately 20 to 30 minutes. Using small amounts of dough at a time, turn out on well floured board and pat or roll to about 1/8-inch thickness. NOTE: Handle carefully as this dough is very soft. Cut dough into 2 to 2 1/2-inch squares. Lift carefully with a spatula to avoid stretching and tearing the squares. Carefully drop the squares into hot oil (about 350 degrees F). Fry until a golden brown on one side, turn and fry until browned on the other size. Remove from the oil and drain on absorbent towels or a rack.